General Shabeg Singh belonged to village Khiala. The eldest son of Sardar Bhagwan Singh and Pritam Kaur. He had three brothers and a sister. Mother of Shaheg Singh was devout lady but she was very practical and a great disciplinarian. She never forgot to remind her children and grand children that they were the descendents of Baba Mehtab Singh and must live up to the family name. Sardar Bhagwan Singh was the village Lambardar and remained quite occupied with the problems of the village folk who always looked to him for guidance and depended greatly upon his advice . From his early childhood Shabeg Singh displayed qualifies of leadership and intelligence much above that of the average village child. He also was an outstanding football and hockey player and excelled in athletics. At the age of 18 years he had equalled the India records in 100 meters sprint and was the District Broad jump champion. However, even though he had a natural ability for sports he did not wish to pursue that as a career, his mind was on the army, which was considered a noble profession. He excelled in studies and generally topped his class. Gen Shabeg Singh was convinced, even while he was still serving in the Army, that the Government of India was curbing the freedom of Sikhs all over India. 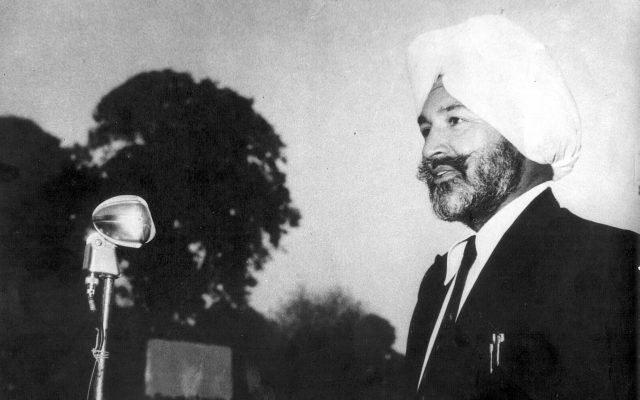 He was aware of the discrimination against Sikhs in denying them promotions and the general hostility of the Govt. who were set to weed out the Sikhs from the Army. The general reduction in the strength of Sikhs in the Army and the policy of the Govt. towards Sikhs in Punjab by denying them capital industry, restricting the Sikh peasant to farming of wheat and crops whose prices were also controlled to deny them full reward. The denial of full and fare shares of river waters were apart of an overall conspiracy to deny Sikhs their legitimate due. At the same time the propaganda of the Indian Government against the Sikhs, painting them as communal. Their demand for autonomy was treated as treachery and anti-patriotic by the Govt, and the “free” press vociferously branded the Sikh demands as secessionist. Now stepped another leader, a charismatic personality. A saint and leader of the renowned ‘Damdami Taksal’ Sant Jarnail Singh Bhindranwale. A selfless, dedicated leader who was frank, forthright and outspoken. He had but one interest only – the interest of the Sikh community – the Khalsa. He did not mince words when he attacked the deceitful politics of the Congress. He spoke out plainly on how the Sikhs had been exploited, and how the Akalis’, in spite of their assertions, had fallen prey to the politics of deceit and disruption. They were accused of neglecting Sikh interest when in power to appease the Central Congress Government. People flocked to him. He soon emerged as the undisputed leader of the Sikhs. His following grew at an alarming rate to the discomfort of the Indira’s congress Government. When Gen Shabeg Singh met Sant Jarnail Singh Bhindranwale, he felt naturally attracted to this out spoken, plain and bold man who was a natural leader and whose word, all Sikhs, specially in rural Punjab, The two became closer and closer with passing time.